It has been cupcake mania here all week! But 36 cupcakes later and I have delicious Funfetti Vanilla Cupcakes with Chocolate Frosting to share with you. These will put you in a party mood. There are funfetti sprinkles inside the cupcake batter and all over the frosting and incidentally ALL over my kitchen floor. But it is totally worth it because cupcakes make everything better. They are the perfect cake for a birthday party, baby shower or any fun-filled celebration. Sprinkles are just TOO fun. 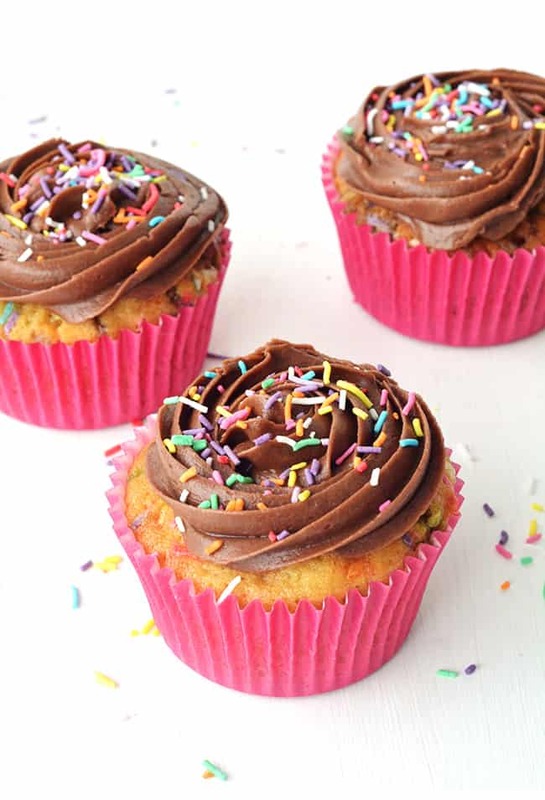 Vanilla cupcakes – they have brought me close to tears. Sometimes too dense, sometimes too dry but oh when they are done well, they are pure perfection. 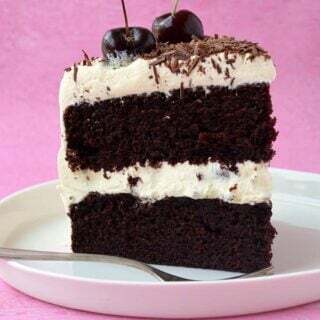 I am a chocolate lover through and through but vanilla is also a favourite – I am certainly not one of those people who put vanilla in the boring category. In fact, I just finished a tub of Ben and Jerry’s vanilla ice cream with chocolate chip cookie dough pieces and it was anything but boring. My vanilla extract constantly needs replacing because I am always using it in everything. For these cupcakes, I decided to opt for the melted butter option as I found the results for the typical creaming method to be a little too inconsistent. Creaming butter and sugar is something that is done so much by feel and can depend on variables such as how soft your butter is and how fast your mixer is going. But these cupcakes take all the guesswork out and are far more likely to produce the same results for you as they did for me. I also found they were far lighter and fluffier which is always a good thing in my books. Literally, the only thing you must remember is to be liberal with the sprinkles – this is an absolute must. Then you will end up with a little piece of chocolate frosted sugar coated heaven. 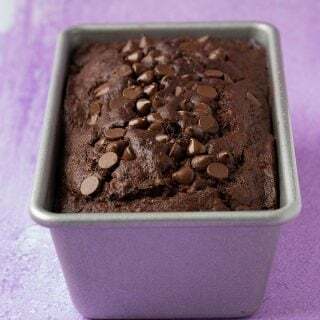 This time around, I opted for small swirls of chocolate frosting rather than the tall mounds of frosting I usually do – my Death by Chocolate Cupcakes are the perfect example. I just felt like the frosting wasn’t the star of the show but instead wanted to emphasis the sprinkles. But by all means go hard on the frosting if that’s your favourite part! See that shot there (points up), I’m pretty excited about it. It’s certainly not perfect but it’s my first action shot with my fancy pants new remote control! I have wanted one for SO long because taking a photo while stretching your arm up over a camera and pouring chocolate sauce at the same time is HARD. And really, a bit of a disaster waiting to happen. But I have managed to do it a few times (like here and here). When using my remote control for the first time, I was a bit surprised that a) it’s still hard to do two things at once, even if one of them is just pressing a button and b) sprinkles are surprisingly hard to catch on camera. I will get better. What did you get up to this weekend? I had a fun one. My husband and I went out for dinner at an Italian restaurant we had never been too and had a gorgeous meal. I had forgotten how much I love going out for a gourmet meal every now and then. 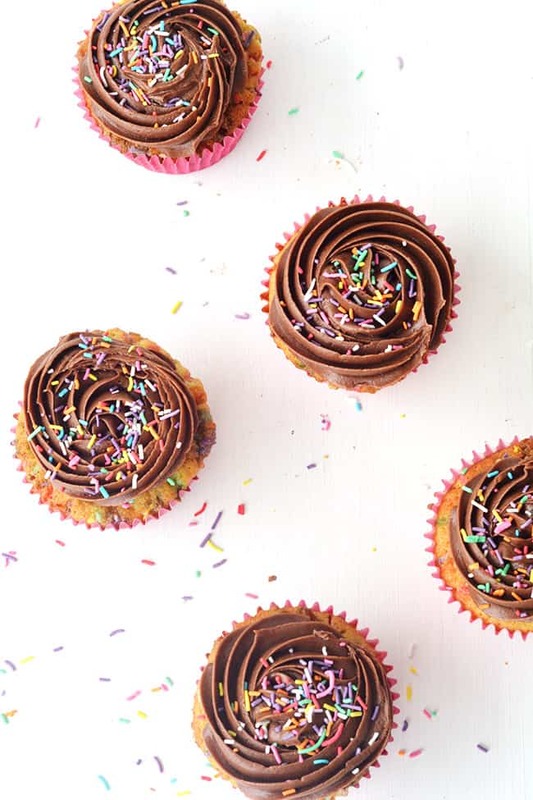 Buttery vanilla cupcakes filled with sprinkles and topped with creamy chocolate buttercream. Preheat the oven to 180C (360 F). Line a 12 hole muffin tin with patty cases. In a large mixing bowl, sift the flour, baking soda, baking powder and then add the sugar – give it a stir. Pop the butter into the microwave for a short burst, 10 seconds or so at a time, until it is JUST melted. Give it a stir with a fork to eliminate any lumps. In a separate mixing bowl, add the eggs, vanilla and butter and whisk together until smooth. Then add the wet mixture into the dry mixture, along with the buttermilk and gently fold until just combined. Then gently stir through the sprinkles. 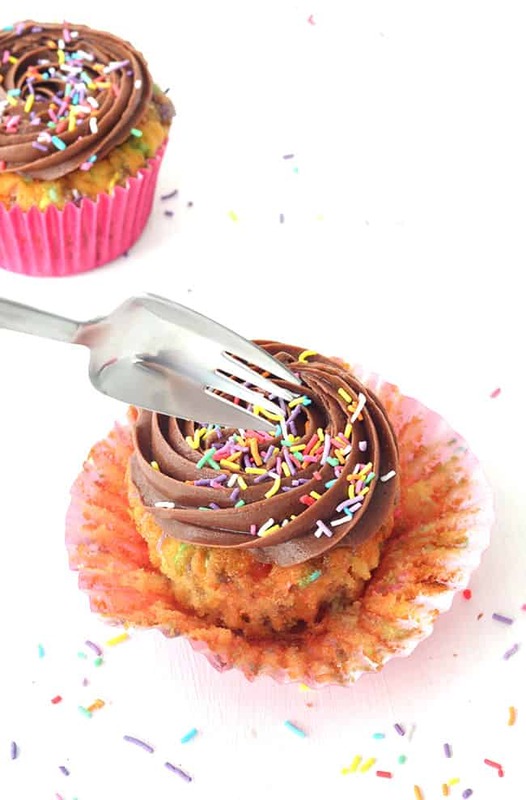 Try not to overmix so your cupcakes stay light and fluffy! Spoon the mixture into the prepared patty cases and pop into the oven. Bake for 16-18 minutes or until just cooked through. Set cakes out onto a wire rack and leave to cool completely. Check them regularly as overbaking may make the cupcakes dry. 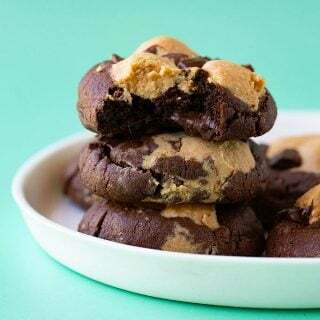 To make the chocolate frosting, add the butter to a large mixing bowl and beat with an electric mixer until pale and creamy. Gently sift in the icing sugar, one cup at a time. Add a tablespoon or two of milk to help loosen up the mixture. Add the cocoa powder and beat again. Add a tablespoon of milk if needed – I added about 4 tablespoons of milk in total but watch out that you don’t make the icing too wet as it will be harder to pipe. It should be nice and creamy but thick enough to hold its shape. 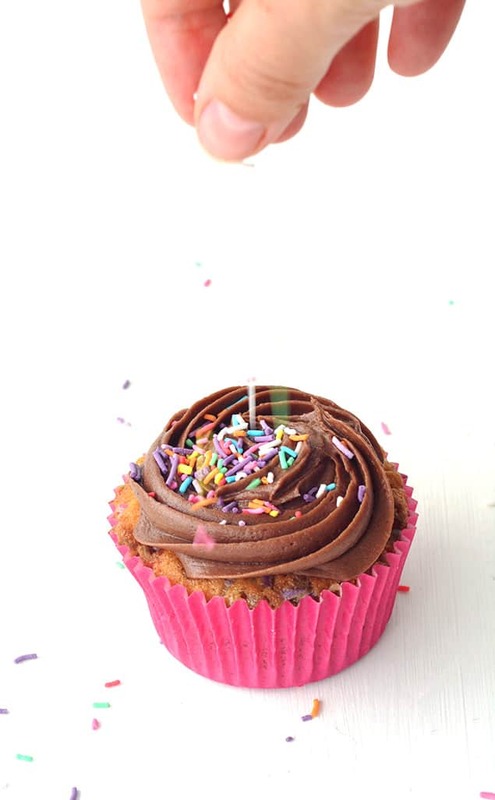 Pipe the icing onto the cupcakes using a piping bag and a large star tip. 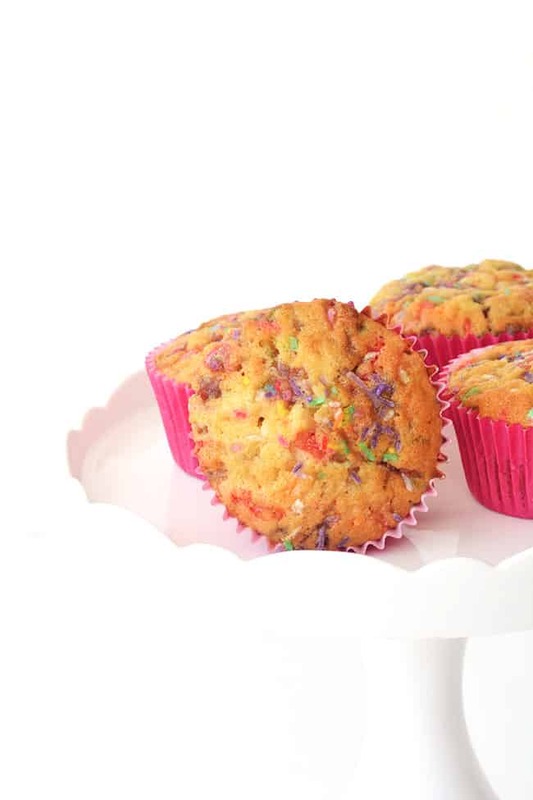 Top each cupcake with a handful of funfetti pieces. 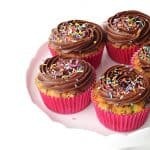 For tips on piping check out my cupcake frosting post HERE. A crowd favourite at my son’s birthday party! HAHAHAHA, ohhh, the action shot!! Sometimes, I am in the most RIDICULOUS position to get an action shot, and every single time, I tell myself I need to get a freaking remote shutter. Either way, I think your photo is beautiful and I love your rule of being liberal with the sprinkles. That is DEFINITELY a must here!! So pretty, Jess! These photos are just gorgeous Jess! I just bought a remote control for my camera too! I haven’t tried it out yet though, but your photos are amazing! I love the sprinkle shot. I also LOVE funfetti. It’s under-appreciated here in Australia, so I am glad you are bringing the sprinkle party Down Under. I love these gorgeous cupcakes! Haha 36 cupcakes sounds awesome! 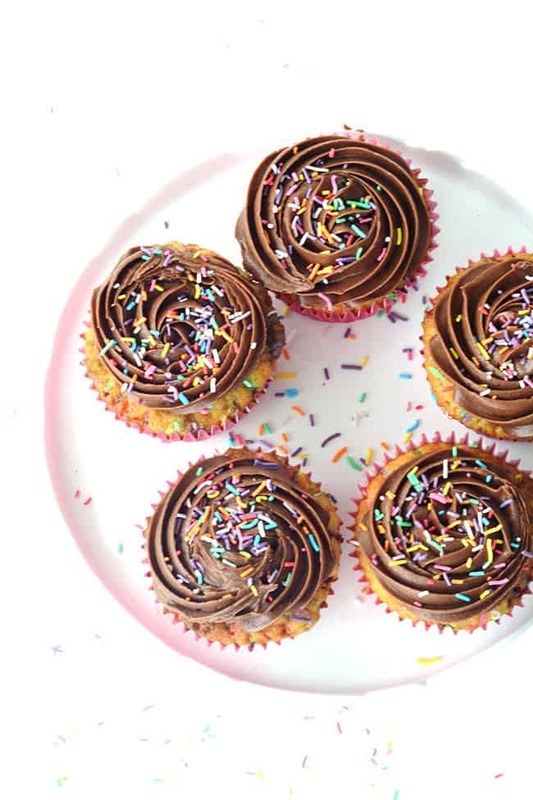 Love that you made vanilla cupcakes, they are my favorite especially when you add sprinkles. So so pretty and adorable! I am with you on using my vanilla extract religiously. 🙂 I put it in everything from desserts, my oatmeal, and I really like to stir it into plain Greek yogurt instead of buying the sugary vanilla flavored one in the store. 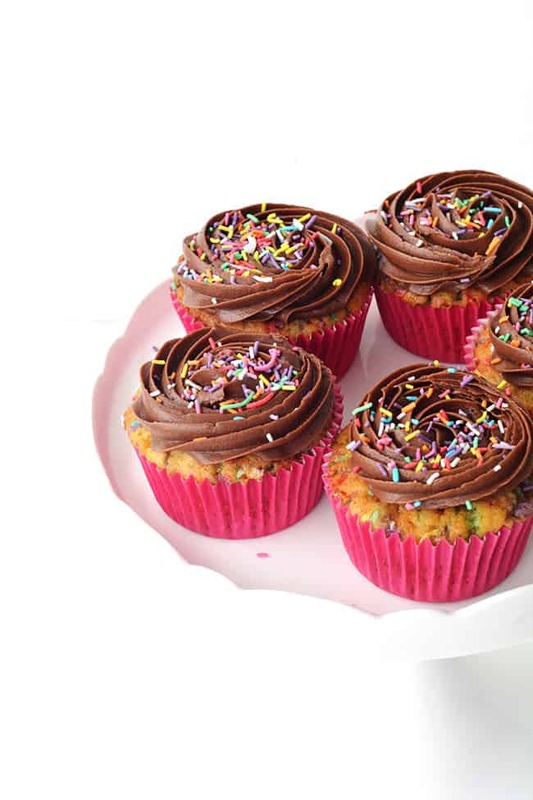 These cupcakes are just darling! Sprinkles just make you smile. If someone came home and found these cupcakes there is no way they could be in a bad mood no matter how bad their day had been. So FUN Jess! I love all the sprinkles, especially in the cake! Your photos are gorgeous! Oh it must have been pure torture eating those 36 cupcakes, Jess 😉 These are absolutely gorgeous. I’m exactly the same as you – I go through soo much vanilla essence and add it to more or less anything sweet! It’s just so delish, plus it smells amazing. I could seriously sniff the stuff all day long! LOVE these cupcakes! SO frikken adorable. And that action shot? Perfect. I need to get a remote control, it’s been on my list for a while. I have taken a few too many shots single-handedly and it is the opposite of fun! I look forward to many more action shots from you in the future ;). Oh my gosh! YUM! These cupcakes are perfect! SO yummy and pretty! Thanks for sharing! I hope that you had an awesome Valentines Day! Thanks so much Cailee! I hope you did too! 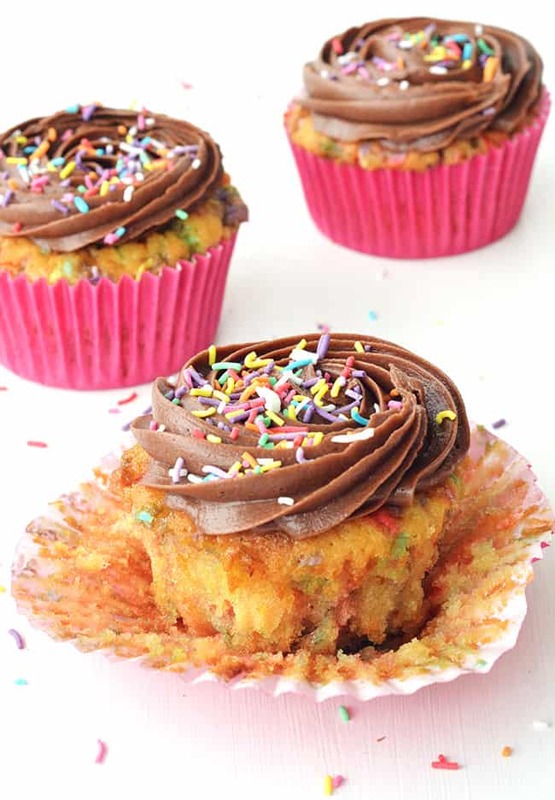 I love bright cupcakes… and chocolate icing is always the best thing!